As far as instrumental typecasting goes, the violin often gets stuck in a rut as being seen as the poster child of classical music. Sure, it gets a few moments in the spotlight of other genres — bluegrass, swing or gypsy campfire tunes — but there are styles that haven’t yet found their way to the instrument’s virtuosity and melodic emotion. Black Violin is lead by classically trained string players Wil B. (viola, left) and Kev Marcus (violin), and joined onstage by DJ SPS and drummer Nat Stokes. Two classically trained musicians have brought the violin, and its deeper, heftier cousin, the viola, into captivating terra nova. 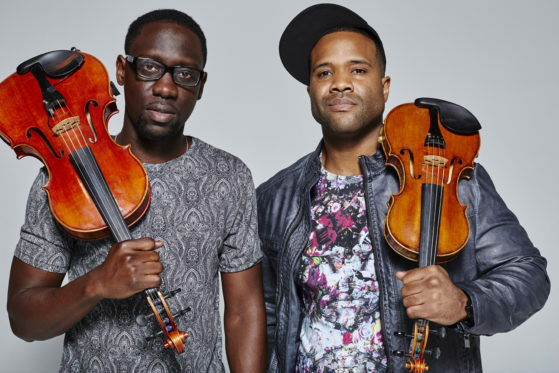 Kevin Marcus Sylvester and Wilner Baptiste, known on stage as Kev Marcus and Wil-B, are the power duo behind Black Violin, a band that uses stringed instruments as matchmakers for two unlikely musical bedfellows: European classical music and African-American hip hop. The result is an energetic and charismatic sound, often with lyrics that resonate with purpose and socio-political reverence. Black Violin will perform at 8 p.m. Sunday, Oct. 28 at the Smith Opera House. They will be joined by DJ SPS and drummer Nat Stokes. Baptiste,who moved to Florida from the Bahamas when he was 11, wanted to study saxophone but was mistakenly placed in the strings program. Encouraged by his mother, Sylvester began playing the violin at age 9. The two began a friendship sharing a music stand in the orchestra at the famed Dillard High School of the Performing Arts in a tough Fort Lauderdale neighborhood. In those days, they lived parallel lives, studying classical in school but listening to R&B, rap and hip hop everywhere else. “One day Kev comes to class and he learns one line from ‘Gimme Some More’ by Busta Rhymes. He played it and we learned it quickly, and we just kept having fun with it,” That’s how Baptiste describes the genesis of Black Violin in a recent phone interview. The two also had “a really good teacher who really cared, and that too motivated us to keep going,” adds Baptiste. Both teens won full scholarships to study music, Sylvester at Florida International University and Baptiste at Florida State. They reunited after college, playing wherever they could: Miami dance clubs (where they convinced club owners to hire them by playing alongside their blasting car stereo), celebrity weddings and elaborate bar mitzvahs, anything to get known and make some money. They took the name Black Violin from an album recorded by Stuff Smith, a pioneer in adapting electrical amplification for the violin. By 2005, they had won the Showtime at the Apollo Legend Title. Two years later, their self-titled first album was released. Their second album, “Classically Trained,” came out in 2013, and a third is on the way. Now well into their 30s, married and with families, Sylvester and Baptiste insist on making making their music as accessible as possible for youth, and supporting music education for all. They regularly perform for students, and in fact for Sunday’s show they will be joined on stage by young musicians from Ithaca and St. Peter’s Community Arts Academy. Today, Black Violin’s compositions are also leaving their mark in the televised world and national events, as the duo have composed and performed for ESPN sports programming, the Super Bowl and even for former President Barack Obama’s 2013 inauguration. They also created the theme song the FOX pilot “Pitch,” about the first woman to break into major league baseball. Such projects represents their mission to a T, as Black Violin is all about pushing beyond stereotypes to find common ground among people of different backgrounds. Who, after all, would peg two black guys to lead the next generation of young musicians to Beethoven, Mozart and Bach, albeit via Rakim and Cardi-B?